Double Suicide in flat on Pentlow Street Putney SW15? 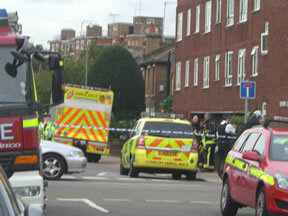 Pentlow Street in West Putney has been cordoned off all afternoon with response teams from all services today. Rumours have been circulatinmg all afternoon but it appears that the bodies of two women have been found in a flat on Pentlow Street. We understand that the Police were called at 10:42am to a second floor flat in Norman Court, off the Lower Richmond Road, Putney, SW15. The bodies of two women were found at the scene. At this early stage it is believed they died of chemical poisoning. No arrests have been made and enquiries continue, with the Police, LFB and ambulance remain at the scene.